President Obama has taken shots across his bow—in both senses of “bow” for bowing to foreign dignitaries and to at least one machine. Instead of being commended for displaying cultural sensitivity and adaptability by bowing to Middle Eastern oil sheiks; former President of China, Hu Jin Tao; the Emperor of Japan, and, most recently, for bowing to a Japanese robot that was trundled over to meet him in Tokyo, he is peppered with flak for bowing too deeply or for bowing at all. True, bows can be tricky: Bow too deeply and you’ll be seen as groveling, fawning, obsequious or generically weak; offer a nod instead of a bow and you’ll come across as arrogant, rude, insensitive or generically crass—that is, if you play the bow game at all. Opt out of the game and extend a hand instead? Very risky, depending on what culture you try that in. In the wrong one, you may end up watching your hand gingerly dangled from your squeamish counterpart’s fingertips like a soiled diaper. I always hope that presidents and prime ministers will play a more prominent role as what is called an “opinion leader”: some respected public figure who generates as well as well as expresses wise public opinion. For example, it would be nice to have a vigorous suggestion and appeal to Americans to abandon gang-banger gangsta and bank-gangster lifestyles for a more civil, civic persona that insists on being aware of and acting on one’s obligations as much as on one’s rights, in virtue of their in fact being morally, although evidently not psychologically, inseparable. OK. That may be asking for too much. 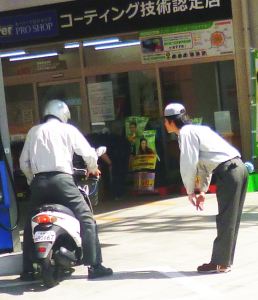 But how about publicly recommending bowing—even if not as deep as the Nagasaki gas station attendant’s bow to a guy on a scooter in the photo I took there recently or his colleague’s musketeer curtsy and sweeping arm flourish guiding a gas-filled “one box” car (cute boxy cars, as they are called in Japan) out the driveway onto the street. To even consider importing the bow from Japan along with our electronics and seaweed, we would have to get over and end the monopoly of our handshake, which, of course is the quintessential, sacred embodiment of our anti-hierarchy, anti-subservient equalitarianism. Despite any disinclination to incline our spines, this may not be as hard to accomplish as one might imagine; after all, we are all expected to gush effusively over every stranger or neighbor’s baby, irrespective of our (lack of ) interest in or enthusiasm for it or babies in general. So, if we expect presidents to kiss strange babies, why berate them for bowing? The latter, as a display of respect, is, in general, no less deserved than the average toddler snog. A useful first step is to distinguish the bow as a display of respect from displays of trust—which, fundamentally, is what a handshake is and has been since its adoption as proof neither party is armed or in a position to strangle the other. Perhaps this is why retail clerks and customers don’t shake hands, viz., they don’t really trust each other, what with shoplifting, crafty upselling and bait-and-switch pricing. Notice that a customer-merchant handshake typically signals the sealing of a deal—i.e., an offer and acceptance of trust and faith that what has been promised will be delivered by both parties. So, currently, what with the retail and office bow being too obsequious and the handshake being largely irrelevant (apart from sealing big deals or as an opening ritual to convey mostly trust or at best dilute respect), customers and those who serve them part with prescribed smiles. As for the evolution of the smile, sociobiologists and ethologists claim it evolved as a tame display of teeth to communicate that although the hardware for a hard bite is clearly visible, there is no matching intent to use it. It is important to note that in these comments, Professor Guthrie clearly provides confirmation of the interpretation of “handshake as trust” (as opposed to the respect function of a bow). “Many mammals have what is known as a wide-mouthed ‘greeting-face’ where the corners of the mouth are pulled backward and upward to reveal all the teeth – a gesture much different from a snarl. Ethologists have interpreted this as ‘See, here are my weapons, but they won’t be used against you‘ (as in presenting one’s hand to be shaken in a gesture of friendship)— ‘I could hurt you with this, but instead it is being presented in a non-offensive way’. An infant’s toothless grin and adult closed-mouth smiles, on the other hand, can be interpreted as even less threatening, since the teeth, like a saber in its sheath, are not revealed or, in the former case, the sheath is empty. Again, like the handshake, it seems that the principle purpose of the greeting or parting smile and its primeval primate antecedents is to communicate a “no threat” message, rather than one of respect or submission. As an observational aside, I can’t resist noting that It seems very odd, to say the least, that a culture—ours—in which everyone wants respect from strangers is also one in which too many of us offer it grudgingly, if at all. The extreme icon of this is the thug in the hood who will shoot strangers for seemingly “dissin’” him, yet will never show them or anyone respect or courtesy, unless they are clearly more powerful. Once again, a terrible imbalance of rights against obligations rears its unbowed head. Predictable resistance to the diffusion of bowing in Western culture will include the argument that unless bows are perfectly calibrated to be equal in angle and duration, the inferiority or submission of one participant to the other will be communicated and therefore established. To this is added the expectation that such perfect synchronization of bows is unlikely and that somebody is going to, in effect, lord it over or otherwise seem superior to someone else when bows are exchanged. Sorry, but I can’t bow to that logic. To these maneuvers and misfires should be added the alpha-male trick of having yourself, as president, photographed on the right of Putin or whomever you are shaking hands with. In that position, your hand will be visible as being above and atop the palm of your counterpart, thereby subliminally suggesting that you are “primus inter pares”—first among equals and more dominant. Apparently, U.S. presidents have been very adept at this. The point is that although these mishaps, miscommunications and gambits are possible, they are generally and easily avoided, because everybody knows the rules and the etiquette. So why not simply standardize the bow in the same way we standardize the handshake, while shaking our heads at the rule-breakers? We don’t attend charm school to learn how to shake hands; we simply learn it through cultural osmosis. Hence, we could do the same with the bow: Standardize it to no more, no less than the Japanese-prescribed 15 degrees (for standard, decorous respect) and 3 seconds—thereby saving the baby of equalitarianism without throwing out the bath water of respect. As for trust, that can be assured by adding one more “rule” to the protocols of bowing. Stand far enough apart to ensure your heads don’t collide.